Remember the days of family time with sprat and flounder netting then on to looking for crabs under the rocks at low tide. Carve your name into the cliff while your mates are having a swing on the old car tyre hanging from a tree. Available for rent is this 1950’s HOUSE at the top of the hill, with fantastic views over 18 acres of farm land and the Manukau Harbour and only a 250 metre walk or drive to the beach. While sitting on your deck you are able to watch the activity of the birds below on the sand bar and your family checking their flounder net or just being kids. There is plenty of room on the lawn at the beach to park your vehicle, kayaks and fishing gear. Kayaks are available for hire, delivered and picked up. It is a great spot for floundering – bring a flounder net if you want flounder for breakfast or a sprat net for the kids to play with. 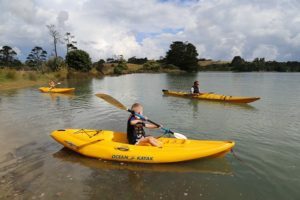 The beach is a safe swimming beach for children and kayaking and also great for kayak fishing out in the Manukau Harbour. Moor your boat in the shallow water or in the deeper water on the other side of the sand bar. You are only 6 km to the 9-hole golf course next to Awhitu Regional Park on Brook Road. Bistro meals are available on Friday nights at the Awhitu Golf Club from 5.30pm to 8pm. You are 6km to the local store for supplies and petrol. Kayaks are available for hire with paddles and life jackets, delivered and picked up for small fee. Contact Colin at SressFreeAdventures for kayak hire.